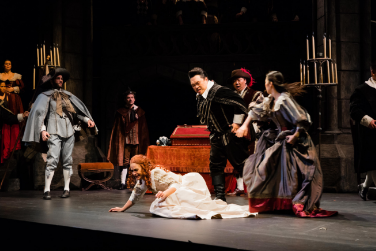 Maryland Lyric Opera presents Donizetti's most compelling romantic drama, Lucia di Lammermoor. The MDLO Orchestra and Chorus are conducted by Louis Salemno. Nick Olcott directs the seductively beautiful, tragic tale of love fraught with power and deception. Lighting design by Joan Sullivan-Genthe. Visit www.MDLO.org for more information. Lucia di Lammermoor is the story of Lucia and Edgardo, innocent young lovers from opposing houses in Scotland. When Lucia is coerced into marrying another nobleman based on her brother's lies that Edgardo has betrayed her, Lucia starts to lose her sanity and their worlds spiral out of control. Often considered the Scottish version of Romeo & Juliet, this gripping story of thwarted lovers and feuding families has remained a favorite of opera-goers worldwide.